Clarendon, NY- The research is done. The script is written. The costumes created. But rehearsals continue as two Genesee Community College professors prepare for the world premiere of their two man show “Now we stand by each other always.” On Saturday, September 8, 2018 at 2 p.m. at the Clarendon Historical Society, Rt. 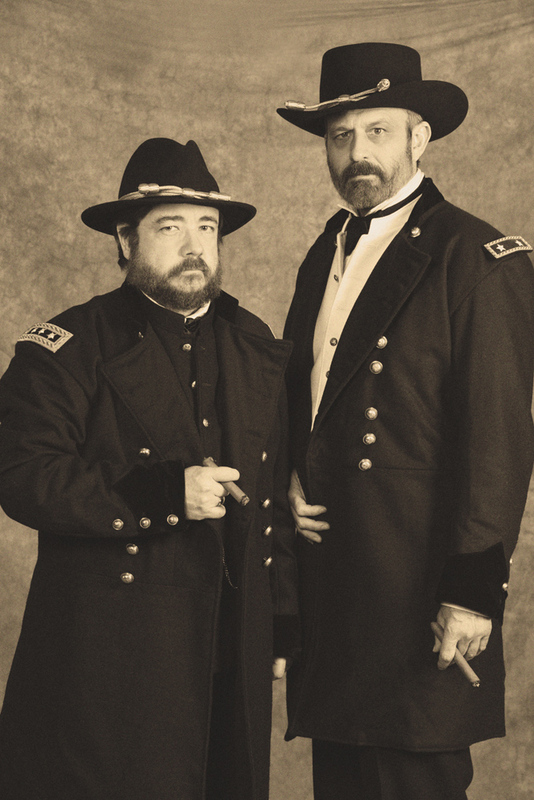 31A, Clarendon, NY, GCC English Professor Tracy Ford and History Associate Professor Derek Maxfield will take the stage, donning authentic uniforms from the Civil War as Generals Ulysses S. Grant and William Tecumseh Sherman to engage in a historical conversation that took place at City Point, Virginia, in March 1865. The performance is free, open to public and - weather permitting - it will be held on the outside lawn. Attendees are encouraged to bring their own lawn chairs. Guests will be asked to envision The American Civil War in its bloody fourth year with U.S. Grant in command of the Union armies and headquartered at City Point, Virginia near the Potomac. The Union Army of the Potomac is besieging Petersburg where the Confederate army is holed up—starving. Sherman takes a break in the action leaving his 90,000 soldiers in Goldsboro, North Carolina to travel to City Point to visit Grant, and together they plot the demise of the Confederate armies and plan on how to close out the tragic war. The overall program was researched, written and directed by Maxfield and developed by Rudely Stamp’d, an amateur theater group created by GCC professors. The show is part of the 2018 Orleans County Heritage Festival, which features a wide variety of heritage-focused events from September 7-16, 2018. For the complete schedule of events, go to: https://orleansnyheritage.wordpress.com/2018/08/14/2018-schedule-of-events/. After the first performance, Rudely Stamp’d will be taking the show on the road with dates already lined up at other venues across Western New York. Performing for schools and other civic groups interested in the history of the Civil War, “Now we stand by each other always” will also be performed as part of GCC’s Historical Horizons first Wednesday night of the month lecture series on Wednesday, December 5, 2018 at 7 p.m.
For more information or to book a performance, check out the Rudely Stamp’d website: https://rudelystampd.wordpress.com/ or contact Derek Maxfield at ddmaxfield@genesee.edu. 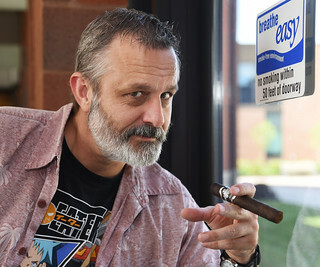 A photograph of GCC professor Tracy Ford keeping pace with good humor as he continues to practice the nuances of holding a cigar in the style of General Sherman.